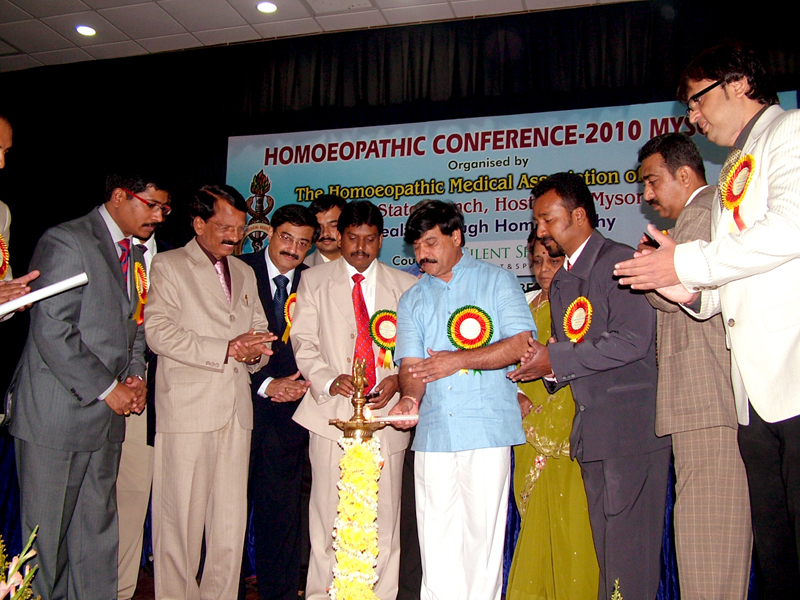 MYSORE.SEP.18: Homoeopathic Association of India (HMAI), Mysore branch of Karnataka State hosted two days conference at Bahadur Institute of Management of Sciences Auditorium. Mr.S.A.Ramdass, Parlimentary Secretary for the Chief Minister , Government of Tamil Nadu was chief guest and he inaugurated the conference and also garlanded the portrait of Hahnemann. A souvenir also released by the chief Guest and Dr.B.T.Rudresh received the first copy. Mementos also distributed to Dr. Veerabramsary, Dr.M.R.Srivatsan, Dr. Santha Kumari and Dr.R.K.Manchanda. Dr.R.K.Manchanda, Deputy Director, Government of New Delhi, Dr.Santhakumari, Deputy Director, Homoeopathy, Government of Karnataka, Dr.Veerabramhasary, President, Karnataka Board of Homoeopathic System of Medicine also graced the function with vote of thanks. Dr.A.B.Jayanth State president, Dr.Srinath organizing Secretary, Dr.Rajesh ,General Secretary and Dr. Vishal Ghanathe, vice chairman Dr.Kantharaje also addressed the gathering , the Secretary Mysore. Dr. Peri Rajagopal, President of the branch welcomed the gathering and Dr.M.R.Srivatsan, the organizing chairman and Member CCH proposed vote of thanks. Dr.Archana Ramesh, Dr.Poornima Anchored programs. The scientific deliberations followed after the inauguration. About 300 delegates participated this two days conference.